The CollegeTracks program helps improve college access and success for students most at risk of not getting to college. The students come from diverse background and many are first-generation college-eligible with no one who has sufficient knowledge to guide them through the college and financial aid application process. CollegeTracks’ Access Program helps juniors and seniors explore their interests and career options, identify colleges that fit their abilities and goals, search and apply for financial aid, and register for and take the required standardized tests. It is the only organization in the Montgomery County Public School system that works with students and their families to submit the Free Application for Federal Student Aid (FAFSA) which is required to get federal, state, and most institutional aid.assists them with the college admission process. Students can access the CollegeTracks staff and volunteers at B-CC each day during lunch or after school (except Wednesdays) at B-CC, or on Wednesday evenings at the Coffield Community Center in Rosemary Hills. During the spring, students heading to Montgomery College receive additional help from CollegeTracks staff who prepares them for the Accuplacer test to help with their placement into credit courses in the fall. In addition to helping students get into colleges, CollegeTracks, with the Foundation’s support, launched a new program called the College Success Program in April 2010, to help CollegeTracks high school alums to successfully navigate through college and graduate. College Success coaches help CollegeTracks alums deal with the organizational, academic and social challenges they face in college, work with them to master the skills (such as time management, financial aid/budgeting, and note-taking/study skills) they need to persist and graduate, and help them create a four-year plan to reach their graduation goal. 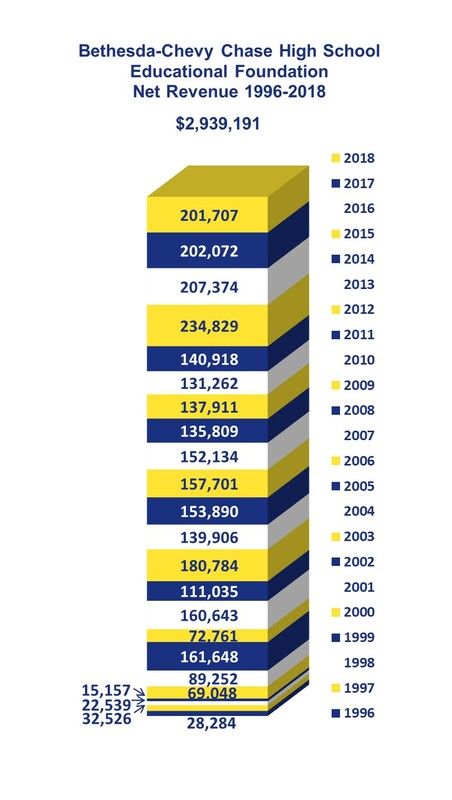 Since 2003, B-CC CollegeTracks has served over 2,000 B-CC students. Nearly every student served has been admitted to a college or technical school, almost 80% have enrolled, and almost half have attained degrees and now work across a wide range of industries and companies, including law, finance, entertainment, technology, health care, education, and public service. Based on the 16-month college enrollment rates for Montgomery County Public Schools students who graduated in 2012, B-CC has an 81.8% college enrollment rate for African American graduates, 75.8% for Hispanics graduates, and 81.3% (the highest among MCPS schools) for graduates who received free- and reduced-price meals services. 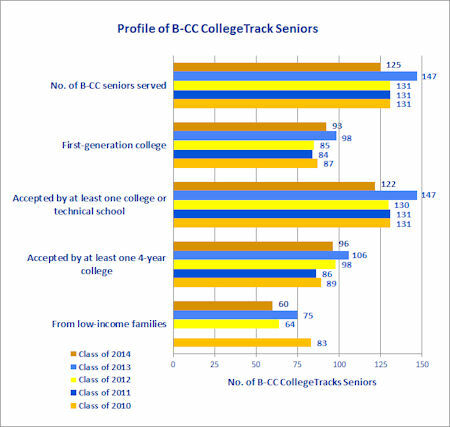 In 2017-2018 school year, B-CC CollegeTracks served 405 B-CC students: 122 seniors (24% of the senior class), 86 juniors, 4 sophomores, and 193 B-CC graduates, from classes 2010-2017, at 32 colleges. This year’s 122 B-CC seniors submitted 590 applications, 98% were admitted to at least one of the 325 colleges or technical schools they applied to, and 70% were admitted to 4-year colleges. These students were offered more than $3.9 million in financial aid for first year college, and 14 received Guaranteed Access grants from Maryland. CollegeTracks students differed demographically and socioeconomically from their peers. Among the 2017-18 cohort, 46% were African-American, 31% Hispanic, 7% White, 3% Asian, 1% Middle-Eastern, and 12% Multi-racial; 93% were from under-represented population; 75% were first-generation in this country; 49% were or had been in the ESOL (English for Speakers of Other Languages) program; and 75% were from low income households. The need for intense college advising was great. In 2015-2016 school year, B-CC CollegeTracks served 319 students: 208 B-CC juniors and seniors and 111 college students who were B-CC graduates. Among them, 68% were first-generation-to-college, 55% were non-native English speakers, 54% were from low income families, and 93% were from underrepresented minorities. 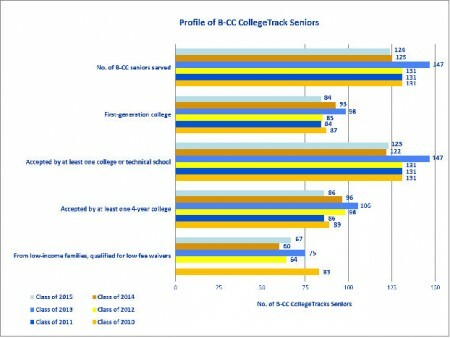 Among B-CC CollegeTracks seniors from the Class of 2016, 96% were admitted to at least one among 137 colleges and technical schools, and 70% were admitted to a four-year college or university. In total, these CollegeTracks seniors were offered $2.2 million in financial aid for the first year of college. During the 2014-2015 school year, two B-CC CollegeTracks full-time staff members and 20 trained volunteers helped 211 B-CC students: 124 seniors (26% of the senior class), 79 juniors (18% of the junior class), and 8 sophomores. Of these, 68% were first-generation college-bound and 54% were from low-income families. Among the seniors, 99% were admitted to at least one of 147 colleges or technical schools with more than $1.3 million offers in grants and loans. 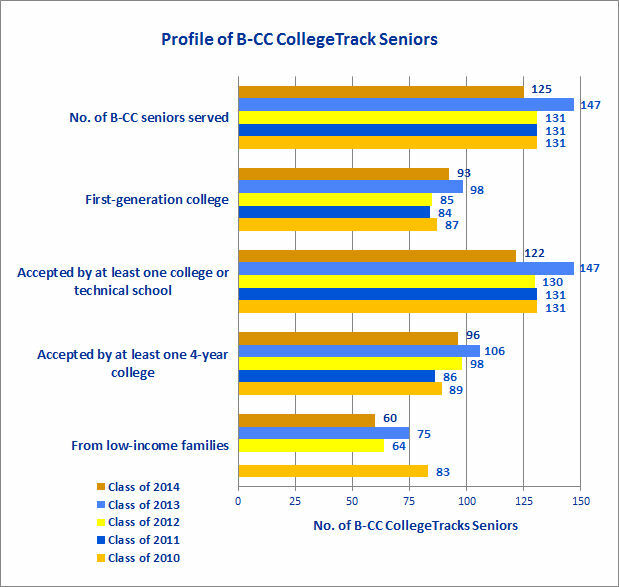 CollegeTracks’ College Success coaches worked with 107 B-CC graduates who were in college. During the 2013-2014 school year, two B-CC CollegeTracks full-time staff members and 19 trained volunteers helped 303 B-CC students – 75 College Scholars, 125 seniors (30% of the senior class), 90 juniors (19% of junior class), and 13 sophomores. Of these, 74% were first-generation college-bound, 65% were non-native English speakers, and 48% were from low-income families. Among the 125 seniors, 99% were admitted to at least one of 145 colleges and technical schools, 77% were admitted to at least one 4-year college, and together they were offered more than $3 million in grants and loans. During the 2012-2013 school year, B-CC CollegeTracks served 243 B-CC students – 147 seniors (34% of the senior class), 80 juniors (21% of the junior class), and 16 sophomores. Among these students, 67% were first-generation college-bound, 51% were from low-income families, and 66% were not native English speakers. Of the 147 CollegeTracks seniors, 100% were accepted to at least one of 200 colleges, 72% were accepted to at least one four-year college, 96% who were eligible submitted a FAFSA, and together they were offered more than $8.2 million in grants and loans for post-secondary programs. CollegeTracks, the brainchild of three B-CC parents, was launched in October 2002 in collaboration with the school’s administration and its Counseling Department, and with an initial $1,500 grant from the B-CC High School Educational Foundation. Its goal was simply to level the college admissions and financial aid playing field among B-CC students. The parents saw students who looked with despair when asked about their plans after graduation. These students came from widely varying backgrounds. However, most were from low-income households and, unlike their middle class counterparts, not one of them had an adult in their lives familiar enough with the American higher education system to help them navigate the complicated maze of gaining admission to college and securing sufficient financial aid to attend. Most believed college was unaffordable. What the parents saw was consistent with research showing that one of the largest barriers to college access is lack of college know-how: how to prepare for college, how to apply, and how to get financial aid. That know-how most eludes low-income students, racial and ethnic minorities, and youths from families with no previous college history. These groups have significantly lower college enrollment rates than their peers in higher socioeconomic strata. And it’s not grades: poor kids with high grades are only as likely to attend college as rich kids with low grades. In Maryland, low-income young adults are three times less likely to attend college than their counterparts from high-income families. Getting into college and finding enough financial aid is a long and complicated journey. With $1,500 seed money and subsequent similar annual grants from the Foundation, CollegeTracks remained an all-volunteer effort for three years. In December 2005, on the basis of its success at B-CC, the Jack Kent Cooke Foundation awarded it a two-year $90,000 grant to expand the program to Wheaton High School whose seniors have one of the lowest college attendance rates in the county. The grant enabled the program to hire and train staff so it could improve and expand its college access services at B-CC and at Wheaton high schools. In FY2008, when the Jack Kent Cook grant ended, the B-CC HS Educational Foundation added CollegeTracks to its signature programs and increased the funding for the program at B-CC to $50,000 annually. With additional generous contributions from local government, charitable organizations, and individuals, as well as in-kind support from the school system, CollegeTracks has been able to expand its staff to reach more students and deliver more comprehensive services. Since its start at B-CC in 2002 with the modest $1,500 Foundation grant, CollegeTracks has matured from an all-volunteer program to one with an Executive Director and a full-time staff that includes a coordinator to manage its large cohort of volunteers at B-CC High School, Wheaton High School, and since the 2015-16 school year, Watkins Mill High School.